Okay, I'm editing this first post, since I've started this thread before I bought it - so some of the earlier posts might not make much sense after I change this one. Oh well. I went looking into Dogwaffle because, after seeing what it does, I was under the impression that it could be the ultimate post work editor for Carrara. Regular image editors work great for stills, but I do animation work. PD Pro: Howler is like an image editor for animated files... or so I thought! Project Dogwaffle might look similar to an image editor by looking at its interface - but that's very near the end of the similarities. Sure you can do a lot of what an image editor can do - and you can even use it as an image editor. It is beautiful for that stuff. But Dogwaffle goes vastly beyond that. It is extremely brush-centric - meaning that you perform much of your work through a brush - even though it doesn't seem like you would. There are also other ways of doing everything, so If it takes a while for the brush-centric methods to sink in, you can use other techniques to put amazing enhancements to existing images, or start from scratch. You can use your brush to store an animation. Then save that brush to a buffer window and grab a different brush and use that. Dogwaffle works with buffer windows to enable you to store anything you are doing along the path of creating your masterpiece. This cool set of functions allows everyone to work in any order they choose. Daniel Ritchie, the brainchild of Project Dogwaffle, is after all an artist. A very good artist who has unlocked the way an artist has to deal with digital graphics forever! He made brushes that feel... yes, feel as if you were really painting with your favorite brush using oil paints on a canvas. Speaking of oils on a canvas, he also made it so that, wherever you are in your project, the current colors on the canvas can be dry, still fresh and wet, or anywhere in between, giving an incredibly analog feel. It's beautiful! There is a lot to talk about, when it comes to Dogwaffle. So I will be editing some more of the posts I've made below if it doesn't seem to interrupt the flow to much. For now I'd like to toss out a few links to help me illustrate how cool this software is. One of the developers, Philip Staigerman, the guy in charge of bringing Dogwaffle into the Daz3d store, releasing it and other cool things and news, etc., to the site that he runs, The Best 3d.com, and many other things (he must be very energetic to be so busy!) also is much of the magic behind helping us, the programs users, to understand its many many features and functions. And he does so in the funnest way possible. He's excellent. What he does, is creates wonderful tutorials while using the software, and releases them to YouTube. There are many more tutorials at his site, but his videos have been my favorite source to learn from. This place is Endless! Ever have some spare time and want to have some fun? Check this place out! Here is a cool Project Dogwaffle Overview of the many versions that you have to choose from. Being an animator, I needed the best that they have to offer for that. So I have "Skyock's Egret" , otherwise known as PD Pro Howler 8.2, which has an impressive list of amazing new features added to an already amazing piece of artist-ware. Here is a list of features added to version 8.2 from version 8.1 just before it! Amazing, right? I know! Well I've been the proud owner of Skyock's Egret for a short time now, and the experience has been nothing short of amazing. I used to have difficulty in image editors, getting a selection just right. In any version of Dogwaffle, you can use any tool you want within this incredible Alpha channel. You can use the usual tools found in image editors, but I've had times when I wished that I could get my selections really precise around very tight details. Dogwaffle lets you paint in the alpha. Yeah... with an unlimited amount of brushes. Truly unlimited. You can take any piece of any image or any little part or the whole part of whatever you draw or paint, and turn it immediately into a brush! What even more cool, like I've mentioned earlier, you can store that brush and make another! Save as many brushes as you like! Store as many things as your computer's memory can handle. I have 16GB and can double that on this workstation, so I can store all the stored thingies that I want! I can help you build your own really cool workstation here There's also a really powerful curve tool in Dogwaffle. In Howler versions, your curve tool has "Rotoscoping" options in a special menu called: "Rotoscoping"! Clever, huh! Well I've made an animation with Carrara where I set up al the trees to have blowing wind properties amongst everything else. Well in the rendering process, one of the trunks to my trees would flash between visible and invisible. CGI animators deal with this sort of stuff all the time. It's not just Carrara that has issues during an animated render. Anyways, normally I'd have to change some settings and try again, not knowing if the next time would have similarly disappointing results or not. Throw the previous render away... right? Well this was a good time to try my hand at Rotoscoping for the first time in my shiny new copy of Howler. Well embarrassingly enough, I couldn't remember how. No big deal... all I had to do is to watch this video, or series of videos, rather, and I was creating my own tracking mask for editing a falling tree trunk in the middle of a wind storm animation. Of course, it wasn't supposed to be just a wind storm. I wanted this animation so that I could take it into Howler, and make a lightning storm in the rain, using my new AnyFX Plugin for the rain FX. The Rotoscoping went very well my first try through, and I didn't use automatic tracking, since my trunk was disappearing on me. Here is the result on YouTube, if you're interested. Here is the tutorial on making lightning and rain. Dogwaffle, not just Howler, has all kinds of great artists tools. Some may not even sound like artists tools, like Particles. The very word used to make me nervous in 3d. But that was before I realized how easy they are to work with - especially in Carrara! But even more so in Dogwaffle. This particles system is applied to a brush and works its magic whenever you start to paint with it. In its simplest form, it shoots out particles according to various, easy to understand and manipulate parameters in the brushes settings panel. However, the Particles brush includes a great list of presets to choose from. You may never even need to set up your own. I know I will! Here, at Daz3d's Store, you can even buy the Particles Brushes in their own little program for only $5.00 at the time that I write this - not even on sale! Check out what we have here at Daz3d. For the same small price, you can even get PD Pro 3.5! FYI: PD Pro didn't become "Howler" until version 6. I say this because Philip may say: "But you would need Howler for that"... so now you know that this would mean PD Pro 6 or newer. Check out the 3D Designer Landscapes you can make with Howler 8.2! ► Dan Ritchie Shows Us How to Paint anOrange! I've been seeing this since I've been shopping at Daz3d, except the older version - which still looks great to this day! I'm going to get it. It just looks too perfect for what I want to do. But I'll even be able to draw right on my video footage! Yeah! There was a review on DogWaffle Pro 6 by a Dana Anis. Is that the same one who frequents the Carrara forum? So I'm going to get this PD Pro v.7 - Howler. I was wondering if anyone here has tried it? I know you can get a trial... I'll do that when I'm nearing the purchase. PD looks like it would be perfect for animated clip post work, doesn't it? Just looks like with this, I won't need to keep borrowing PS from my nephew's computer (even though he lives in the neighboring duplex). He has a Mac, so it's all backwards for me to use that anyways. I have theGimp, Someone set me up with a link to Art Weaver, which I've downloaded but haven't tried. Gimp has been okay, but I still go next door to use PS. He's in Multi-media college and has the full-blown CS from Adobe. But... like I said. It's Mac. Not to rip on Mac, but - how does anyone ever get used to that? Geeze! I've use it for video editing and it works great. A new version, PD Pro 8.2, is in the works. Also, you sometimes can find an older version of Dogwaffle on sale at DAZ and it can be cheaper to buy an older version when it is on sale and pay the upgrade cost to the newer version. I did that and saved about $50 if I remember correctly. Support is excellent and if you buy it, you'll get emails on development, new tutorials, and other things. Brush wise you'll have to convert your photo shop brushes to use them with it. This isn't difficult. Perfect! Yeah, they have 5.1b in the store for $50 less. But 7.2 is already at such a great deal... I'll support the cause. Was trying to watch through some of those awesome (and many!!!) video tutorials, but I got stuck in on my hair project - when I'm actually supposed to be working! I'm in trouble now! Thanks Jay. I'll be Howlin' and Wafflin' soon! tryed it off and on for years - not a big fan - to many other free ones to used . Looking for a decent animation editing tool that won't break the bank, yet has a multitude of features that allow me to conduct various levels of post work on sequenced images. Well Project Dogwaffle Pro 7: Howler goes even beyond that. It lets you open, edit and save avi files. This looks like the exact product I was looking for - and I found it right here at Daz3d! Amazingly, I was checking out PD Particles, thinking it was a plugin pack. No. For $5, it's a stand-alone image software! Same with the $5 PD Pro 3.5! Amazing. That's really inexpensive for those tools. You don't need any of that with PD Pro 7.2 (or the up-and-coming Pro 8). For this is an entire culmination of everything they've got - or so it seems. Okay, just learning more, I am quite certain that I'll be able to (should I decide to, which I might) use the Dynamic hair that I like so much, and remove the friz frames selectively (just the hair) to eliminate the jitter. Another option on that same note, is that I could blend the differences, and yet another method would be to store the hair frame data - any frame I choose, and use it to filter out the jitter caused by the friz or kink shader during animation. Granted, this is all theory based on learning from the great information gleaned through video tutorials at Project Dogwaffle - The Daily Dose, where you spend less money and spend more time Waffling and Howling! Gotta love this guy! Talk about the perfect painter software for the animator, though. At least it seems. We'll find out soon. Download the extensive Help Manual Here and print it out. Did you know that you can get a free plugin to turn an AVI into an Animated Brush? You can load an animation or video from Avi file directly into the cutom brush as an animated brush and paint with it - even paint video on video!!! Convert AVI and Save to animated Gif using the free DoggyFX plugin. Also supports importing animated gif and saving to MNG!!! And let's get Waffling and Howling!!! Some of the free plugins are all ready included in newer versions of the program. A few aren't though. Pixelean makes a version of AnyFX for Dogwaffle that is worth purchasing. Also, for those who like space scenes. Tutorial to do a rocket exhaust. I haven't been feeling well today, so I'm just kickin' back with my dog on my lap, watching The Dailey Dose, which is a playlist of TV shows, 15 minutes long, that are Dogwaffle tutorials. Less Money, More Howling! I'll assume you have seen this post but if not, here it is. I just bought 7.2 here on DAZ as well. No, I haven't. Thanks for this! Any links to anything Howling, or otherwise Waffling... I wanna know! I am quite certain that I'll be able to (should I decide to, which I might) use the Dynamic hair that I like so much, and remove the friz frames selectively (just the hair) to eliminate the jitter. Another option on that same note, is that I could blend the differences, and yet another method would be to store the hair frame data - any frame I choose, and use it to filter out the jitter caused by the friz or kink shader during animation. Hmmm. I'm going to have to experiment once I get this. Now I'm having visions of using a few renders of the Long, curly Dynamic hair, and just make some brushes with it. I am using the Proxy figure that Phil W includes in the Advanced Carrara Techniques set (the hair originated from the hair he included as well - very nice stuff! This will make it even easier because that proxy is already in place to use as a simple mask - so I can just render out the hair as a still image at the climax of motion in any given direction, and I just saw a tutorial on how to take those several images an sort of tween them in PD Pro. This could work perfectly and rather quickly as well. C3DE issue 05 has a review of PD Pro 5 which might be useful. It seems that Carrara was made to work with PD Pro, and PD Pro is made for Carrara. It will be the ultimate compliment. Thanks for the update, Jetbird. I always look forward to a new C3DE mag! See, using this feature alone (Making a Spritesheet for Animations) should make it very possible to perform the task I'm speaking of. Dan has another one, earlier in the playlist about the 3D Designer, that illustrates how that feature, i combination with this one, will (or should) allow me to correct the jitter. And, at the same time, speed up all of my Rosie Renders - having only to give her a low-poly placeholder for hair, knowing that it will later be replaced. Brushes are incredibly powerful tool in PD Pro. Well, even in the paint-only PD apps. The possibilities are, well... Howlingly awesome! Carrara's gonna love it's new roommate! Yeah, it will. It's just one more application I will be learning now. I wish there were more hours in the day. Oh yeah, I just d/led Howler 8.2. She's out! Oh yeah, I just d/led Howler 8.2. She's out!I saw that! Philip rocks, doesn't he? Some shots taken from PD Pro 8's 3D Designer! Here's another Dogwaffle update. We are releasing PD Pro 8.2 Howler today, Saturday February 16! PD Pro 8.2 Howler - Here it is! * A greatly wrangled plugin folder and browser, also adding support for tooltips for plugins. * GPU support. An enhanced 3D Designer is the first to make use of new GPU support. * GUI improvements and cosmetic changes for Windows 8. In 8.2, we're adopting an "everything down to the raw loader" philosify, meaning we're dusting off a lot of old plugins, internalizing some, refreshing the GUI of ones that haven't been udpated to the newer look, and just generally making a lot of little updates and polishes. * There's a new forcefield type that can be used to create gravity/explosion fields. * The foliage tool now also supports forcefields. * Cosmetic changes to better support the flat look of Windows 8. * Interface tweaks for more usability. * Fixed an error in saving pigment profiles. * Saving Avi's now remembers the last filename during a session, and there's an updated panel. * Grid and Artist guide settings are now saved and restored. * A couple of fixes on the animated brush timeline. * The plugin panel now supports tooltips for each plugin. * Changes to the plugin panel now also allow date and size of plugin creation, author and information about the plugin, plus pattern matching and opening the Explorer. * The plugin panel and lua browser are now more functionally and visually similar. * Fixed 'numeric select' not activating from the alpha panel. * fixed "store brush as image" feature to not crash if a brush is not defined. * GUI_Server, hence lua scripts with a GUI, now use the new visual style. * The Brush/Transparency/Transparency tool now uses the new visual style. * The brush keyframer now uses the new visual style. * Frame Painter now uses the new visual style. * Fixed some layout problems with the print panel. * fixed crash if entering numbers above 255 in gradient panel. * The tritone filter now supports rendering to an animation. The "multicolor" animated lua script version of it has thus been removed from the filters/animated cate gory. * There's a new 1 bit per channel filter under Color/1 bit dither... Possible uses: preparing a graphic for pixel for pixel output to a printing device maybe. * The Mod dog (music) player plugin is updated to run under 64 bit Windows. Rock on! * A number of plugins have been updated. For example, the RYB mixer plugin now operates more smoothly. * The installer no longer automatically runs the program after installation, for technical reasons. It should be run from the start menu. * The "Undo buffer to animation" feature was leaving out 1 undo step. fixed. * The tool panel is now adjusted on startup to always be on the right side of the sidebar if both are located together on the left side of the main panel. * Eliminated all lua script usage from main functions, replaced with internal code. * "Unit calculator" on the image resample panel is renamed "Other units" to sound less mathy. * "Store image" is renamed "Store image copy" to be more clear. * The brush key menu is renamed "Transparency" and reorganized. Most of the items have been internalized. * added Dogwaffle.Dog_ColorToRGB(c, r, g, b) subroutine in the plugin interface. It is not a function, but a subroutine. The return results are in r,g,b which is converted from the color value in c, such as "&HFF4422;". This routine is added to support .net framework plugins that often have fuctions that accept colors in R,G,B values instead of packed format. * Added the bmp image sequence to avi converter plugin to the misc utilities menu. * 8 bush keying plugins internalized. * a number of quantizing (color reduction) plugins have been interalized. And more to come, so stay tuned. First of all, it shows how great the tools work - and how nicely this software can behave just like oils on a canvas. You'll see how he'll grab a glob of color with his brush and glance it onto the parts of his painting where he'll need it and then, now that the glob of color is on the canvas where it belongs, he works the built up paint into the colors under it - just like using oils. Dan is incredible at this - he demonstrates this well in many other videos as well. Secondly, it displays how much of a fantastic artists Mr. Ritchie is! Holy Smokes, is he ever good! Philip and Dan are amazing. I've never seen the developers of a product behave so passionately about the job that their product is designed to perform. The Daily Dose is an exhaustive project by these two, teaching and exploring the many... or should I say endless? Yeah... teaching and exploring the endless possibilities of Project Dogwaffle. As I await the glorious day that I get to open up Howler for the first time, Philip and Dan are showing me directly within the software's interface how to use it. It quickly becomes obvious that Howler (and Artist*, for that matter) has such a vast range of tools, settings, optimizations, etc., that it would take forever and longer to examine all of what it could possibly do. I think that this is simply because so much had to be put under the hood to allow them to do with it what they wanted to do with it. So, since they needed to be able to work with paint, while it was still wet on the canvas, achieving that goal opened up far more availability of customization than what was originally intended. This sort of thing happens all over Dogwaffle software. Because of that it turns out that there a many many ways that an artist may approach reaching the same end result - so every artist can work in their own style with a minimal amount of having to adjust to the software. It's really fun when either of them is in the middle of a tutorial and they find a new way of doing something. They already know, and are explaining three other ways to perform the task, and stumble upon a whole new way - simply because their talking and working and a fortuitous accident occurs. The idea of using an oil painting appearance to at least part of the look of my movies is thrilling. As I learn new techniques during my The Daily Doses of Waffling and Howling, my imagination is growing and visions are taking my mind to areas I've never even considered. GPU utilization. Really? I feel very strongly about the union of Carrara and Howler - totally. Okay, I was talking about using Howler to assist me in taking the jitters out of my Dynamic Hair. This Video Clip will illustrate that initial problem, but also shows more problems with this hair that I think Howler will address just fine. Notice how the glow channel blasts straight through the hair? Like it isn't even there. I am still experimenting with the hair itself to get the final look that I want - which is a very wild-child, super long and curly hair. If anyone has ever used Dogwaffle to actually paint hair onto a moving animated figure, I'd love to hear your story. That is actually what I think I shall use as my first attempt. I'd like to use a selection of the hair at various points along the timeline, within Howler, as a method of painting onto each frame of the video. In Dan's Horse animation episode of the Daily Dose, he demonstrates a situation that I think would get me into the results I need. As I get further into these episodes, I'm finding many ways to do many different things. This is a miniseries focused on using PD Pro 8 - from the very start. You may already have used earlier versions of Project Dogwaffle, or you may be very new to this. Either way, we hope that this will help you enjoy it even more, and learn new tricks. Project Dogwaffle, in all of its various offerings from the earlier free and nearly free versions all the way up to the latest Howler, seems incredibly robust in features that simulate the user as an artist and the screen as a canvas or paper, and the tools being the artists choice of media. I'm really glad that my check finally arrived, and now the only wait is for the darn bank to open :) because this whole Project Dogwaffle has got me entirely excited - and I cannot wait to blend its infinite abilities with my Carrara works. Here, Philip gives a really basic example of using dogwaffle Howler and the AnyFX plugin to perform a little post work on a Carrara avi render. Many other video tutorials (there are so many to chose from via browsing TheBest3D.com) indicate so many more possibilities. One that really caught my eye included brush features without adding pigment - so you'd be using all of the brush characteristics on the underlying image only, which could be very powerful for applying various FX to an animation. This one, "galeria natural - PD Pro 8 Howler foliage exploration" is simply a showcase of someone playing with the new PD Pro 8.2 particles brush "Foliage" brush - which actually grows realistic, yet artistic foliage with a single stroke. Many presets may be loaded, while you may also invent your own - specifying how the particles grow for each phase that you apply to the brush. If you peruse the "New!" video index above for the foliage brushes, you'll see detailed information on working with this extraordinary set of tools. 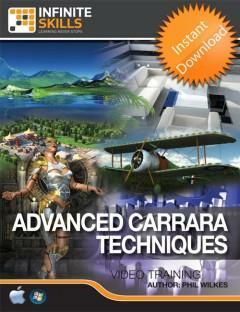 I find that, the more I explore these videos, which are very well mastered, the more ideas I gain towards using this software with Carrara.